Ashleigh's Patience Project Documentary about Domestic Violence And the Aftermath when Love Wont Let Go & Kills. It began a Journey that would save thousands of women and Create New Laws to Protect the Innocent. This is not just about Ashleigh Lindsey's death but the life and voices she created especially within her Mom, Tara Woodlee. Ashleigh's Patience Project Documentary "Official Trailers"! 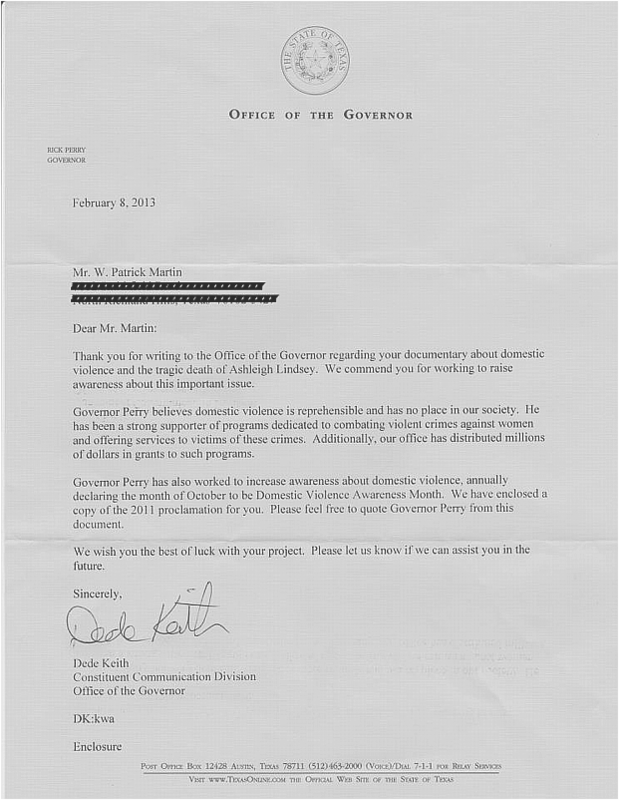 Letter from Governor of TX, Rick Perry supporting Ashleigh's Patience Project Documentary! © Content Copyright 2012-2018. ASHLEIGHSPATIENCEPROJECT.COM. All rights reserved.